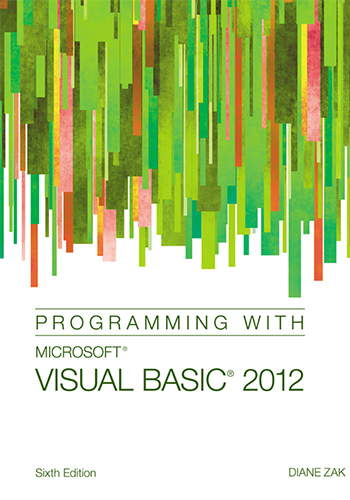 PROGRAMMING WITH MICROSOFT VISUAL BASIC 2012, 6E by best-selling author Diane Zak is the ideal choice for your introduction to programming. Readers learn to master the basics of effective programming as they work through a wealth of hands-on applications in this book\’s engaging real-world setting. Numerous learning features address today\’s varied learning styles with an approachable visual presentation, helpful step-by-step tutorials, and engaging «You Do It» activity boxes. Even students with no prior programming experience learn how to effectively plan and create interactive Windows applications. This edition emphasizes GUI design skills and object-oriented programming concepts throughout.